Her own anonymous grant program is called Anonymous Was a Woman, in reference to a line in Virginia Woolf’s “A Room of One’s Own,” to pay tribute to female artists in history who signed their paintings “Anonymous” so that their work would be taken seriously. The donor behind the prize wanted to remain unknown. 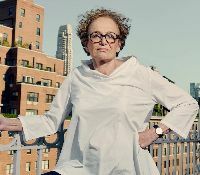 But now she is stepping out from behind the curtain: Susan Unterberg, herself a once underrecognized female artist over 40.